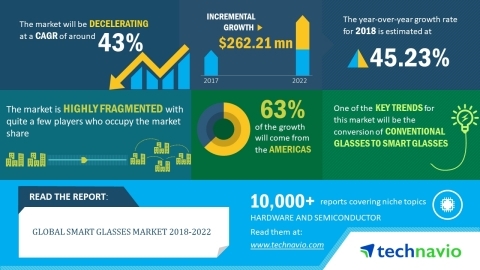 According to the global smart glasses market research report released by Technavio, the market is expected to post a CAGR of around 43% during the forecast period. However, the growth momentum of the market is expected to decelerate due to a decline in the year-over-year growth. This research report titled 'Global Smart Glasses Market 2018-2022' provides an in-depth analysis of the market in terms of revenue and emerging market trends. It also includes an up-to-date analysis and forecasts for various market segments and all geographical regions. In 2017, the developer segment accounted for around 60% of the smart glasses market share and is projected to decline to nearly 44% share by 2022, exhibiting almost 16% decrease in market share. The conversion of conventional glasses to smart glasses is an emerging trend, which is being witnessed in smart helmets. FUSAR, which is a community-driven platform for connected cameras, communications, and safety technology has created a platform of interconnected products. These products function as standalone or together using fusing communication, camera, and safety technology. Using the FUSAR application, Bluetooth headsets of any brand can communicate with each other. Technavio's sample reports are free of charge and contain multiple sections of the report including the market size and forecast, drivers, challenges, trends, and more. With over 500 specialized analysts, Technavio's report library consists of more than 10,000 reports and counting, covering 800 technologies, spanning across 50 countries. Their client base consists of enterprises of all sizes, including more than 100 Fortune 500 companies. This growing client base relies on Technavio's comprehensive coverage, extensive research, and actionable market insights to identify opportunities in existing and potential markets and assess their competitive positions within changing market scenarios.